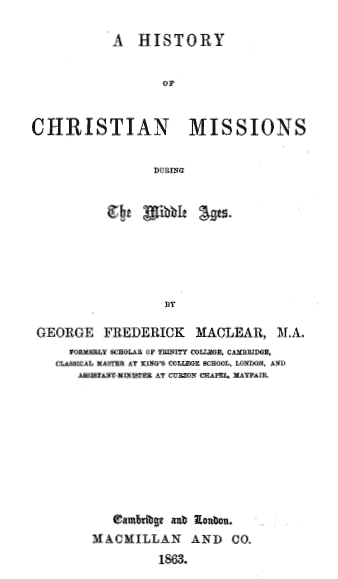 George Maclear’s History of the Christian Mission in the Middle Ages records the spread of Christianity in Europe and beyond from 340 to 1520 AD. Along the way he discussed the contributions to mission made by St. Columba, St. Patrick, Augustine of Canterbury and St. Boniface. Works on this period are fairly rare, so it nice to be able to make one available in this way. This book is in the Public Domain. Seven Lectures on Medieval Missions by Thomas Smith D.D.